I've been in a funk the past few days. Not sure what it is, all I want to do after work is go home and sleep. Tonight I forced myself to do some art. At first it was a little frustrating, but I just pushed forward and quickly got into the groove. This page definately represents how I've been feeling, so dark and so complicated... messy even. 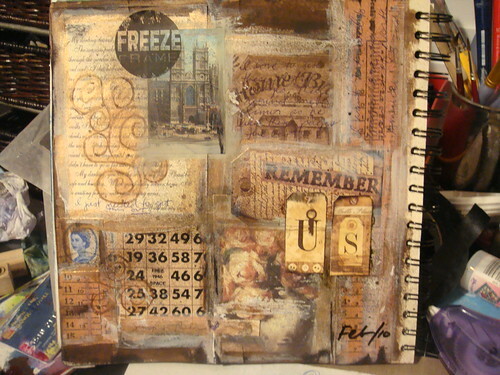 Love the brown collage - freeze, catch the moment, remember! I can sense your mood in the painting - searching, possibly inside you "follow your heart"! Another fantastic page....I think you must be the Queen of Layers! 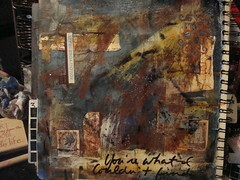 And I like the collaged piece, too. I'm lovin' the brown tones. 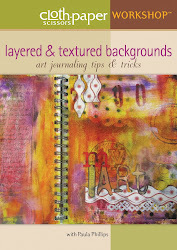 You do fabulous layers-love the brown page. Didn't you just get back from traveling? No wonder you are tired!! Sometimes you gotta listen and follow your body's cues. Great pages, lots of 'argh' + blah in the first. i hope you are better now! my fairy-witches are casting a protection spell for you! WOW, both of these pages are amazing. I love the dark emotion that comes out in the first one - I'm still having trouble getting that "real" feeling on my pages. And the collage could easily be framed, it's so pretty!